Mom panda bear Yang Yang is a true star in the Vienna Zoo. She is famous for delivering most babies in such a place. 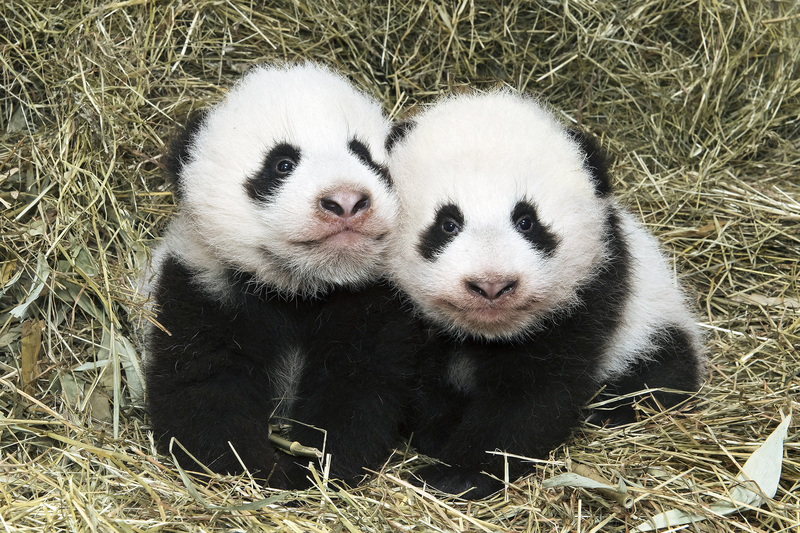 Twins Fu Feng and Fu Ban are fifth in a row, have turned two years old and are getting ready to return back to China. That is the rule for all panda babies born outside of China. But Yang Yang has one more talent, she loves painting. Her artworks are already sold online, while the money earned was put towards creating a book on pandas, Pandassigned by herself, and available from December. But, most credit for the happy lifestyle of this breed of pandas, Giant Pandas, in the Vienna Zoo, goes to Mrs. Dungl Dr Eveline, zoologist and panda curator. Thanks to her enthusiasm more and more panda babies come from this place, while their living conditions are almost ideal. 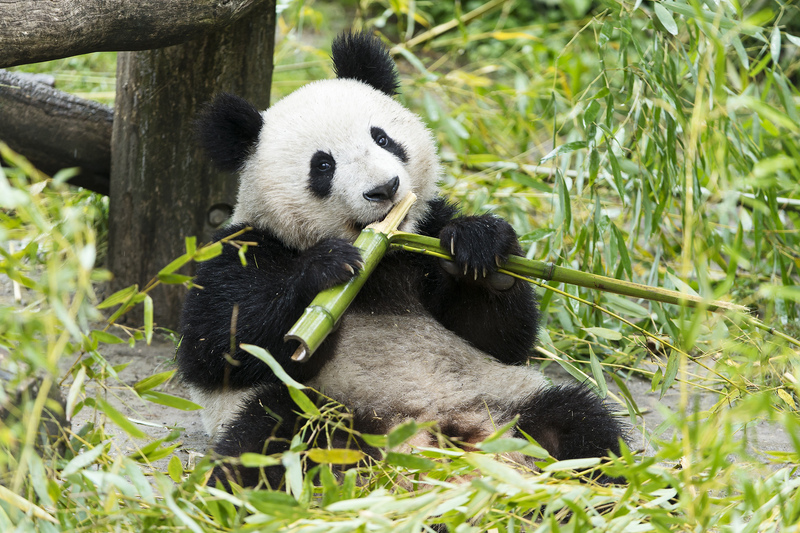 Besides for this lovely animals love of bamboo (on average a panda eats from 9 to 14 kg of bamboo), much time and effort is spent towards their training for travel and adaptation. We asked Mrs. Dungl to reveal what makes a panda happy in the Vienna Zoo, and how was the idea for this original book born? Twins Fu Feng and Fu Ban turned two in August. What are their habits and characters like? Fu Feng, the female, is by the nature of her mother. Yang Yang used to be a bit shy when she was younger. Fu Ban is like his father Long Hui. He is very calm. This also was obvious on their second birthday. Fu Ban and his mother unpacked the presents while Fu Feng watched from a distance. They are soon to be returned to China, their homeland. How will they prepare for the trip and what does it look like? We desensitize them for transport. The transport box will be placed in the enclosure already weeks before they return to China. We place food in the box, so they are eating inside, become familiar with it and feel safe in there. Later on we close the box and even lift it up like during transport and their calm behavior is rewarded with vegetables. Is there a possibility, for future pandas born in Zoos in Europe, to stay in their place of birth? 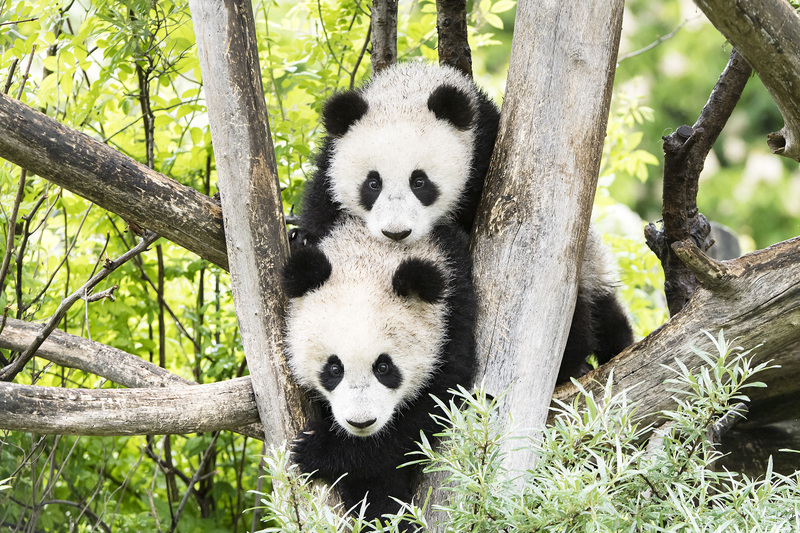 Giant pandas in the wild also leave their mothers at the age of two. At this time they have to search for their own territory. If they don’t want to leave their mothers they even drive them away. So we would have to build another enclosure and they would not have the chance to meet other pandas in their age. They would stay alone, so it’s a good thing for us when they return to China although saying goodbye is never easy. Mom Yang Yang seems to really like staying with you, she gave birth to five babies since. You must have a happy panda magic wand. What is crucial in your opinion? 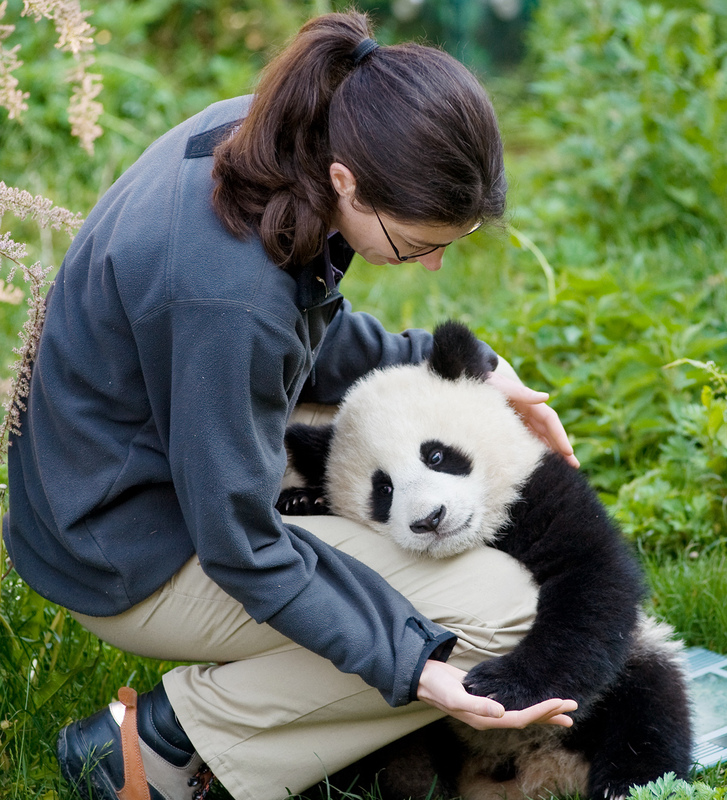 There are several aspects that are important to make a panda feel comfortable. Enclosure size and structure are important, the micro climate (shady places and humid areas), the food (we mainly feed bamboo, like in the wild), gentle management that focuses on the animal, privacy – especially before and after birth,…Another important aspect was the harmonic relationship between Yang Yang and Long Hui. Yang Yang even learned how to paint. How was her talent discovered? Yang Yang always loved the training sessions (positive reinforcement traning) for medical procedures or cognitive tests. This training makes health checks easier but also is a good mental enrichment. To provide some diversity in the training sessions, this new task was set up. Her artworks are sold online and all the profits are spent on funding a book about pandas. When will it be launched and where will it be available? The book is available until 9 October on the Startnext crowd-funding platform at www.startnext.com/en/pandasat a special price, it is also able to have a name immortalised in the book or have it signed by Yang Yang. You can even book the experience to join the keepers backstage and be near to Yang Yang signing your book. The book will be published at mid-December and can be purchased then in all bookstores and in Vienna Zoo. It is a German / English Edition for panda fans all over the world. The Vienna Zoo is one of four European zoos in which pandas live. 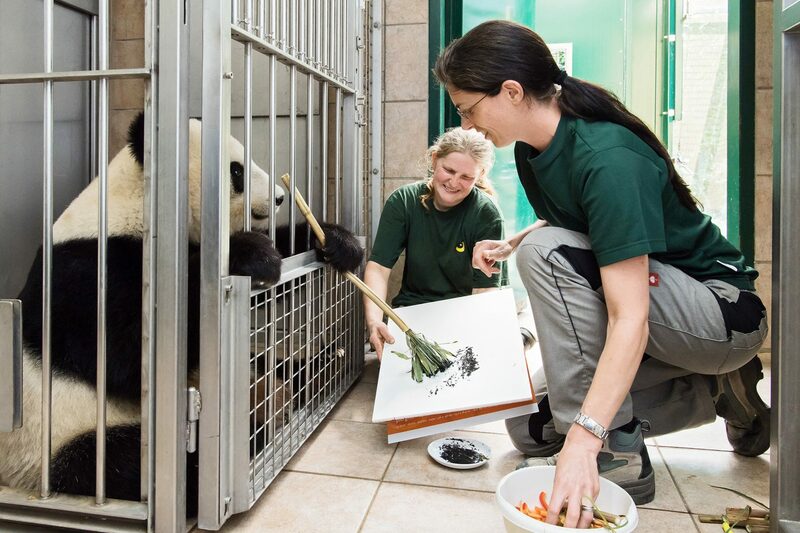 What does a day of caring for a panda look like? 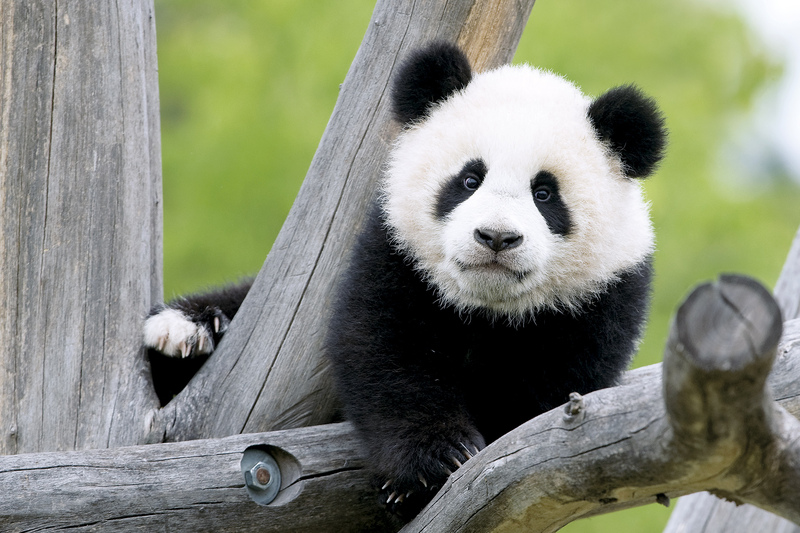 There are already eight zoos within Europe that keeps pandas. The most important thing is to provide them enough bamboo to eat. That does not only make them full and satisfied but it keeps them occupied for 40% of the time. On the other side it also means that plenty of waste bamboo and feces has to be taken out of the enclosure. So most of the time, a panda keeper has to clean the enclosure and feed fresh bamboo. Besides that a bit of training and enrichment is done with/for them. Which is harder on them, hot summer days or icy winter ones? Do they like snow? Pandas don’t really like the hot summer days. That is why they have air-conditioning in their houses, providing pleasant temperatures. In the outside enclosure, just like in the wilderness, pandas lay down to sleep in the shade of trees and bushes. It is easier to bear the heat in the cool shade. In contrast to other bears, the giant panda does not hibernate during the winter. Bamboo grows the whole year round. He can find plenty of food also in winter. Pandas don’t mind snow or bitter cold. The soles of their paws are covered in fur to stop them from slipping. How friendly are they? Are there any organized interactions with visitors? Most pandas are rather calm and gentle. But they can also react aggressive if they are overstrained or not happy with a situation. Still no interactions with visitors are organized, mainly due to hygienic and health reasons. Pandas can get severely ill if they are confronted with cat and dog diseases like canine/feline distemper or parvovirosis. How did you decide to devote yourself to pandas? Have you spent any time in the Chinese panda center? As soon as I have finished university the zoo announced to get giant pandas. I therefore applied for a job in the panda section and also submitted a research proposal on the visual abilities of giant pandas. Luckily I got the chance for both! Before the pandas arrived in Vienna I spent two and a half weeks in the panda center to learn how to take care of a panda. Later on, when we returned the first cub born in Vienna, I could spend another two weeks in the center to help him to adapt in the new surroundings. What is your future plan for their living and breeding conditions? The twin cubs born in 2016 will return to China by the end of this year and Vienna zoo hopes to get the chance to house a new male soon. Do they need to learn Chinese before traveling home? Pandas are good in reading body language. There is no need for them to learn any spoken language. Each goodbye is difficult. How do you handle separation, and do the pandas sense a big life change that awaits? The age when they are separated from their mother was chosen due to the age when they leave their mothers in the wild. Around two years of age they can easily deal with separation and change in their living conditions. Will there be new babies soon? We hope that Vienna zoo will get a new male, that he will get along well with Yang Yang and that the breeding success will be continued. Besides for the fact that each baby is named after a hundred days pass, in order to honor the Chinese tradition, are there any more culture related procedures? Concerning the panda husbandry there are no other culture related procedures. Well, their names have always been Chinese names, we took up the Chinese tradition that the first part of the name is the same for each offspring (Fu – lucky) and we named the first male cub Fu Long (Lucky Dragon) and the first female cub Fu Feng (Lucky Phoenix) in respect of the perfect/celestial couple in Feng Shui. Like Yin and Yang. In the new millennium we still wear fur like our ancient ancestors, why?